The magnificent Alhambra fortress was the last stronghold of the Moorish kingdom in Europe, with a palace that highlighted the decorative splendor of that civilization. 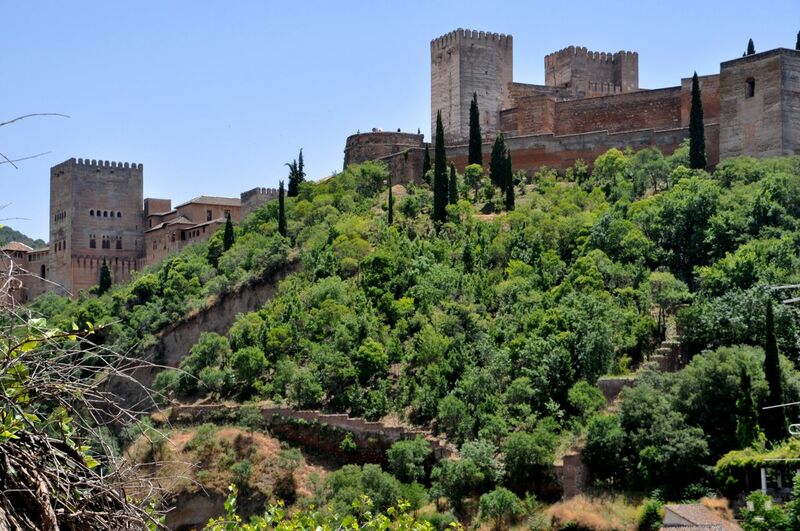 While the rest of Europe dragged through the Middle Ages, Granada blossomed from the 1200’s to nearly the 1500’s. What you see today is merely a glimpse of what the magnificence must have been. Time marched on, and in this case not for the better. The Christians built their own version of beauty on top of some of the Alhambra, it fell into ruin and was populated by the homeless, Napoleon stationed his troops there in the 1800’s contributing substantially to its ruin (he blew up several of the gates), and of course time itself dulls or eliminates the paint and gilding that was once a source of its beauty. Nevertheless, as you’ll see – it ain’t bad! You need tickets to see the Alhambra, and they verge on scarce. Only (!) 300 visitors are allowed to enter the palace every 30 minutes, and with up to 8,000 visitors a day, that’s a problem. The good news is that some areas of the Alhambra are accessible and free, and we’ll visit those first. We’ll walk up the hill, which is pretty steep, as you can see in the picture to the left (and as you want in a fortress). Note that the walls of the Alhambra connected with the walls around Granada, the remnants of which you can see in the photo above. There’s a reason this place was the lone hold-out for 200 years. Granada goes back in time a millennium or much more, so it is no surprise that there are walls on top of walls on top of repaired walls, and ruins here and there. When one encounters the fortress walls/towers, they are impressively vertical and remarkably well-preserved. At one point there were 30 of these towers. Pictures below show the Justice gate into the fortress (there were only 4 gates). As you can see, it was built for defense! Big motha’. In addition to the gate’s four 90º turns for better defense, it has a metal door that looks pretty sturdy. And it’s not just a functional gate – there are remnants of decoration. The Moors had a thing for water. To the Moors, coming from the desert, water was precious; they reveled in it and surrounded themselves with ponds, fountains and gardens. There is a river at the base of the Alhambra’s hill; the Moors diverted water from that river at a point upstream and uphill, running it down through the sultan’s summer home and garden, the Generalife, and then via aqueduct into the Alhambra city complex and palace (summer home and water path shown to the left; details later in the post). Much of that infrastructure still remains and some is still functional, as shown below. Once through the Justice Gate, the Wine Gate greets you. One of the oldest constructions of the Alhambra, it separated the fortress (Alcazaba) from the town (medina) and palace within the Alhambra walls. surprise is that most of it is an open, completely circular courtyard, a circle within a square. The large courtyard is surrounded by marble columns that create a covered balcony and a gallery (above, right). With tickets in hand, we now pass through the Wine Gate and face the Alcazaba, which certainly looks imposing even from inside the walls. The courtyard in the front was originally a moat, which would have made it even more impressive! The fortress is old, from the 1200’s, but is mostly in ruins, much of the destruction caused by Napoleon’s troops. Pictures are shown below. Note that the entrance into the fort, shown from different levels, is a back-and-forth path protected by several gates, the approach incredibly exposed from above. I would NOT want to be part of the attacking party! We’re now going to walk to the Generalife, the summer palace and gardens of the sultan. It’s at the other end of the Alhambra complex, past what used to be an urban town (medina) of 2,000 people who lived up here. The medina was also destroyed by the invading French, and ruins are only sporadically visible. It is, however, a pleasant walk (see below). 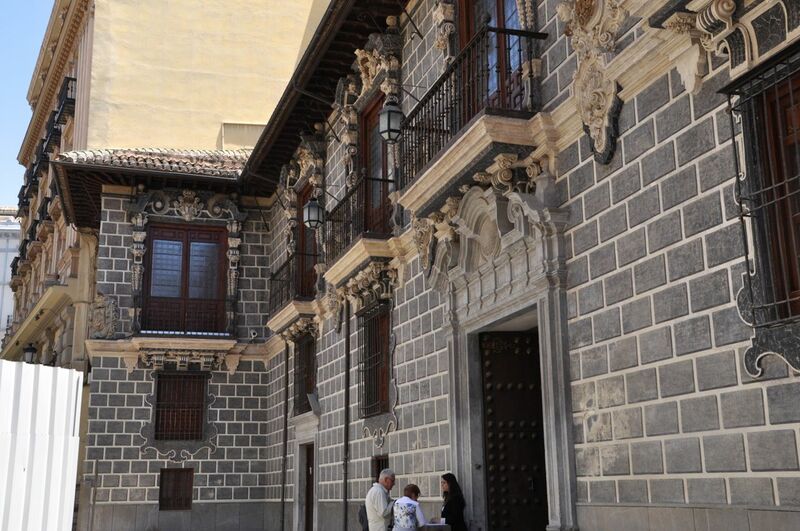 One of the interesting buildings we walk past is the Parador de Granada San Francisco. A Parador is an historical building that the Spanish government runs as a fancy hotel. 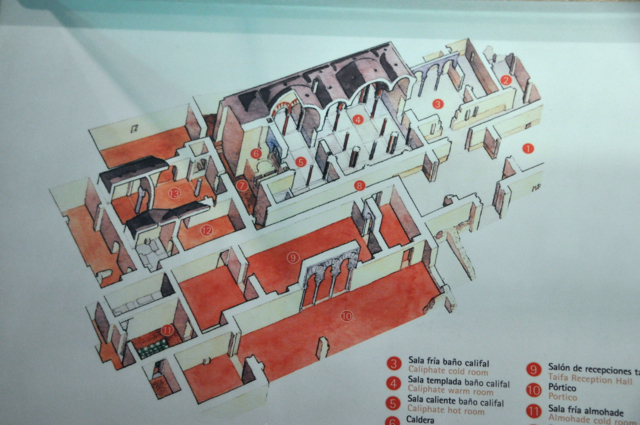 Within the Alhambra the building was a Moorish palace but was subsequently converted to a Franciscan monastery. As you can see below it’s quite attractive. How cool would it be to sleep here within the Alhambra! But, alas, it’s far too expensive for our budget. We continue to walk to the Generalife. 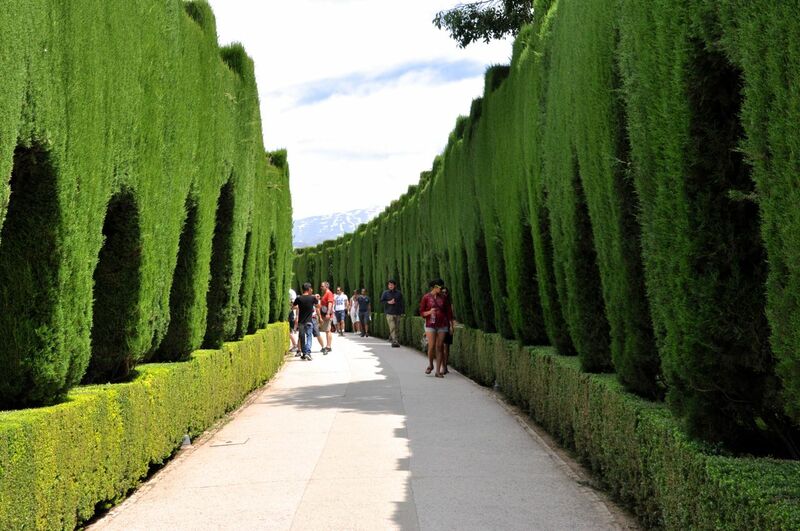 Tall evergreens line a charming path to the extensive gardens, where more evergreens in many shapes form shady, secluded, hidden areas around fountains and pools. Everything seems to be in bloom. It’s hard to capture the beauty of such an expanse in the small area of a photo, but I do take some side shots of flower areas with a view of the Alhambra. At the end of the gardens is the sultan’s summer home, a cool and quiet escape. You saw the overview of the summer home earlier (above) when we discussed the aqueduct. Now we’ll go inside this house. Even after all these centuries, it’s still pretty spectacular for a “get-away” place. Pictures below. Finally, it is our time to enter the Palacios Nazaries (miss that entry time by 30 minutes and you don’t get in). 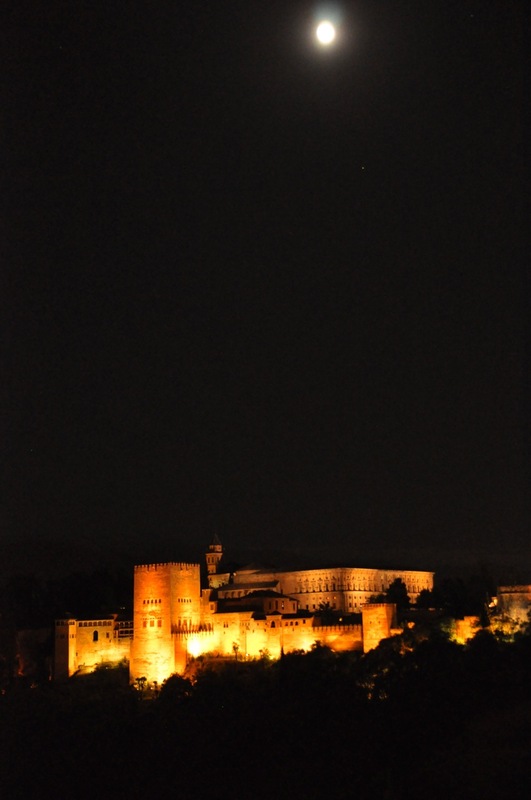 This is the jewel of the Alhambra, the reason most people come to Granada. 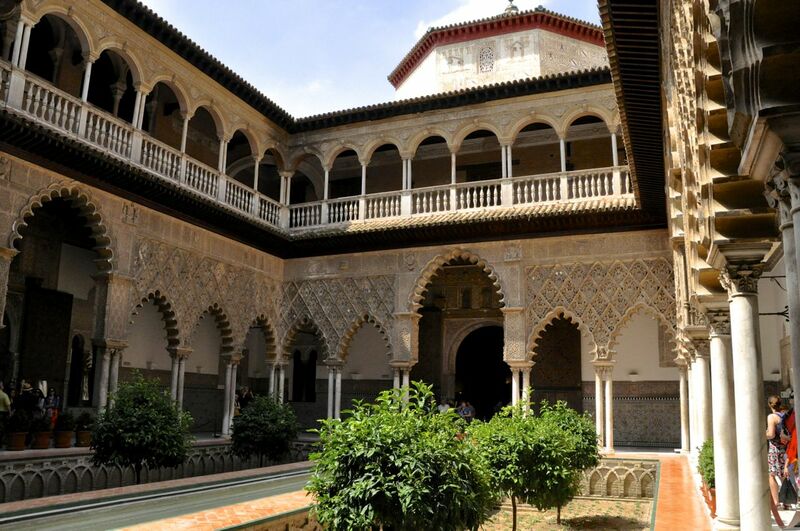 The royal palace was built mostly in the 1300’s and is the best example of the elegant Moorish civilization of that time. 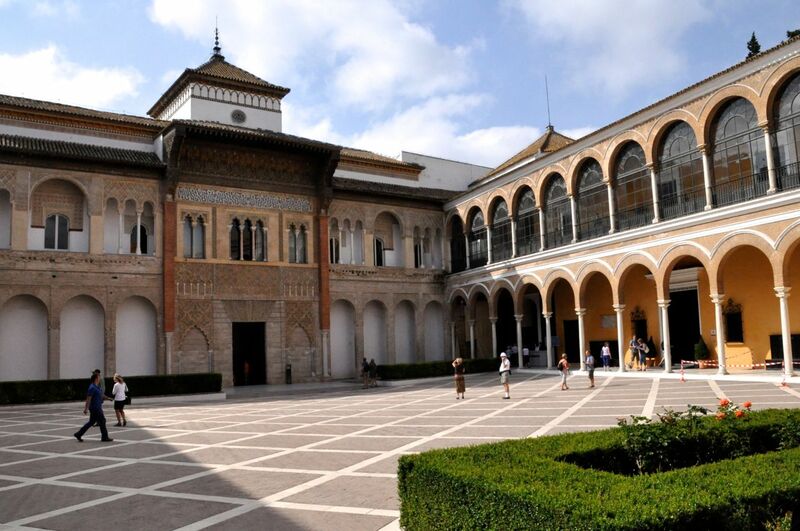 Remember that gorgeous palace in Sevilla’s Alcazar (post of May 1, 2014, “Sevilla’s Alcazar”)? It was copying the real McCoy here. We are going to deluge you with photos! There is much to admire – rooms decorated with molded plaster from top to bottom, beautiful and intricate carved wood ceilings, stucco “stalactites”, intricate ceramic tiles, and beautiful filigree windows. Notice our repeating “beautiful” and “intricate” words. What you will see is a lot of repetition in a decoration. It just keeps going, yet it is not too much – well, maybe some of the tile patterns are optically active, but usually not. The overall effect is what I call a “visual mantra”. Something beautiful repeated and repeated and repeated, and you stare at it and your heart rate goes down, your blood pressure drops, and tranquility descends. And your mind says “Jeez, is this ever beautiful”! And you turn your head and see a new and different wonderful pattern and the feeling repeats along with the patterns. We’ll just be showing you picture snippets, but we think you’ll see. Enough talk! I’ll divide the tour by rooms. We’ll start by walking through a few “administrative” rooms, including an oratorio (a Mecca-oriented prayer room). No words – just walk with us. OK, mea culpa, we’re showing this room a bit out of order within the administrative rooms, but we just wanted to highlight it. Not only is this room beautiful, it has a beautiful view of Granada’s Albayzín. It’s named for the two fragrant myrtle hedges. It’s pretty. 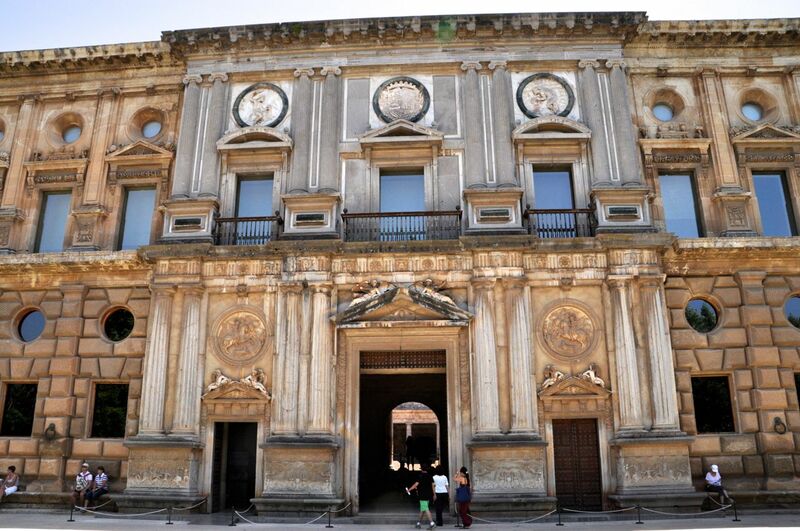 Some chambers were demolished to make room for Charles V’s palace, but happily only a few. The lateral sections were living quarters for the women (harem). It’s so named due to a corrupted Spanish translation of the Arabic; it should read something more akin to “Room of divine blessing and luck”. It’s a waiting room before entry to the Grand Hall of the Ambassadors, the sultan’s throne room. My guess is that it was a bit more ornate back then. “Oh, God, fighter of the devil, please help me. In name of God, who is merciful and has mercy. Oh, God, please be company and salvation for our Master Mohammed and his generation. And say: May the anger of God and of every devil that allows the disturbance of hell help me; and deliver me from the evil of the envious ones when they are going to be envious. And no deity but God is alive, whom we must praise eternally. Praise to the God of centuries“. The floor was originally marble, but is now tiles from the 1500’s – not a bad update! When in use, the room would have been in semi-darkness, with the lighting concentrated on a throne opposite the entrance. A visitor would have stepped from the glaring Court of Myrtles into this dim, cool, incense-filled, intensely decorated world to meet the silhouetted sultan. Of course you have to imagine the pillows and Persian carpets and throne and ivory-inlaid chairs and vases and hookah pipes and probably gorgeous ladies and scribes and bustling aides. We would have been impressed, and struggling to make eye-contact with the all-powerful sultan! There are connecting passageways to private rooms of the royal family (and servants, of course). We’ll just show pictures. 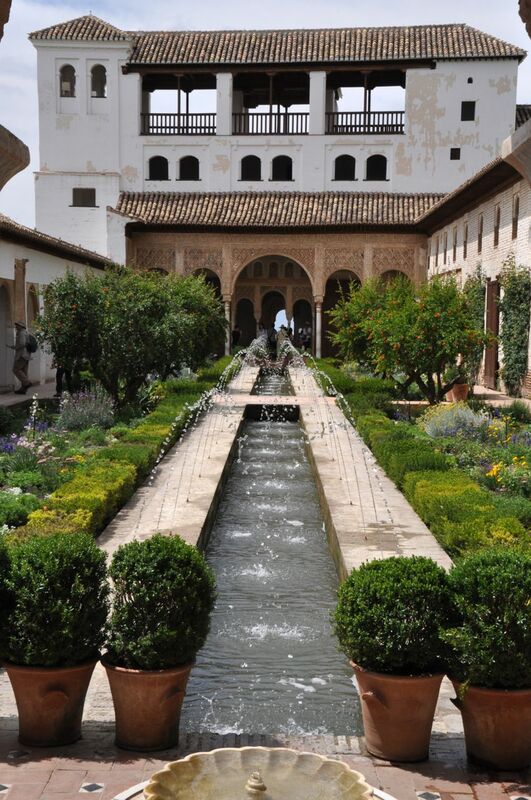 This is the private quarters of the royal family, and probably the most famous area of the Alhambra. We’re just going to show you the pictures (a lot of pictures), and then we’ll talk. “…Such a translucent basin, sculpted pearl! And its liquid silver goes over the daisies, melted, and even purer. without letting us know which of them is flowing. and the warned drains are here against it? where the flowers of Earth rival the stars of Heaven. What can compare with this fountain, gushing crystal-clear water? The Courtyard is beautiful indeed, then and now. This was the Sultan’s living room, with an exquisite ceiling in the shape of an eight-sided star. It has a history – a sultan took a new wife and wanted to disinherit the children of the first marriage, so he invited them (the Abencerrajes) to dinner and killed all 36 – nearly the entire family – but he missed the son who would ultimately assume the throne (some of the blame for the decline of the Muslim world had to do with such constant infighting. The Catholics weren’t your only enemy). Why am I not showing you pictures of this incredible room? It was closed. Bummer! Below is a picture of the outside of the building, and next to it an internet picture of the ceiling. This is just a connecting hall at the back of the Courtyard of the Lions. It is, of course, gorgeous. It’s named for the two slabs of white marble on the floor flanking the fountain carrying water to the Courtyard of the Lions. It is the center of a series of chambers where the sultana and her family lived. The ceiling is incredibly beautiful. Well, that’s the shooting match. There is still some beauty to be seen on the way out of the Palace, such as the Patio of Lindaraja, but it’s not on the same scale. That’s it! It is a beautiful palace, putting the monstrosity of Charles V’s palace to shame. He thought he could improve on the Palacios Nazaries??? We thought the art of the Moors was amazing. Hope you enjoyed it. Our next stop in Spain is Madrid. 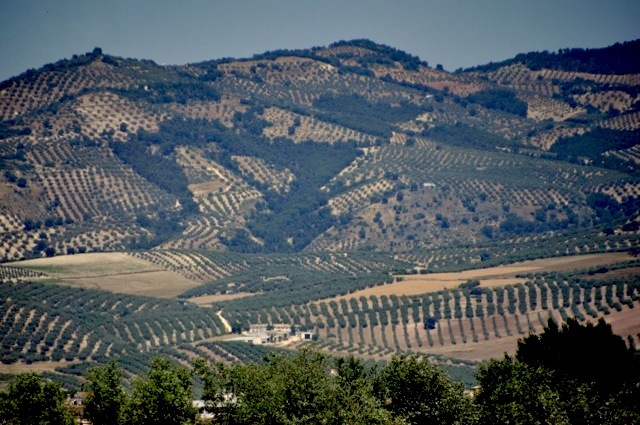 Throughout most of Spain, the trip to any city is past hill after hill planted in rows of olive trees. Grenada, nestled at the foot of the Sierra Nevada mountains, is no exception. Pretty, isn’t it? 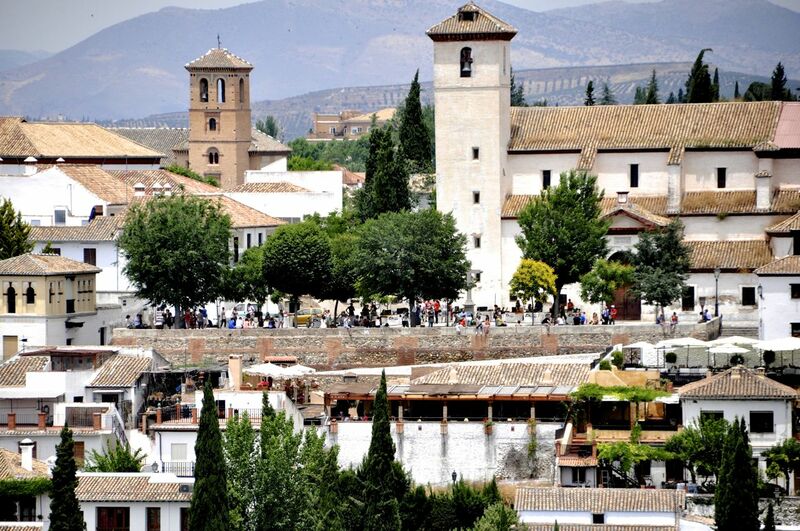 As Cordoba declined, Granada grew, and for a time Granada was the grandest city in Spain – and ultimately the last city in Spain under Muslim rule. 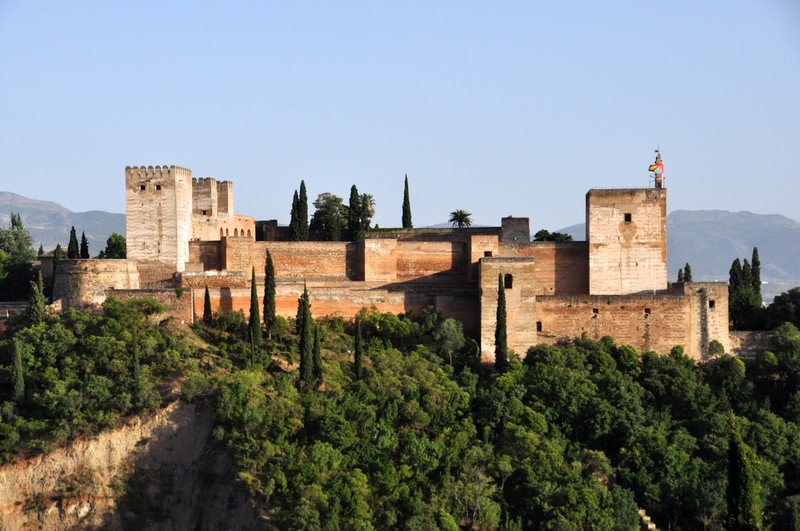 The Alhambra fortress, the last stronghold of the Moorish kingdom in Spain, finally fell to the Reconquista in 1492. Until then it was the greatest Moorish palace, highlighting the splendor of a Moorish civilization that nowhere else shone as brightly. 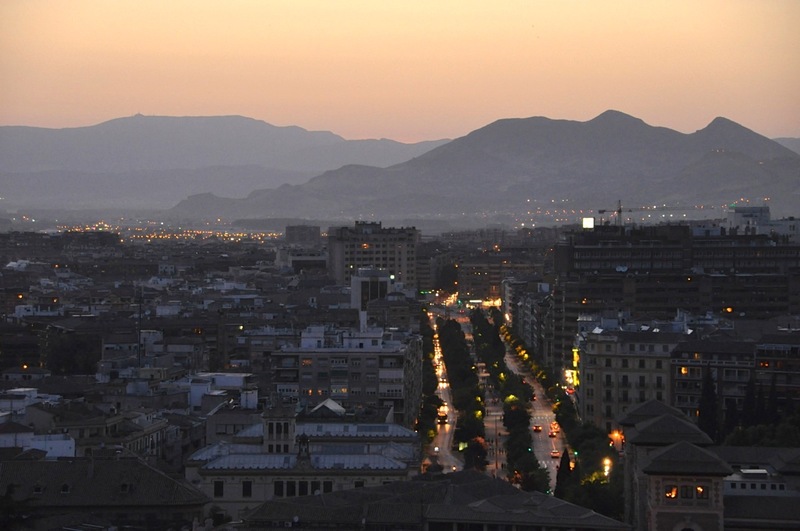 Today Granada and suburbs have a population approaching half a million; it’s a modern city, as shown to the left, but the historical center is absolutely a world apart. It dates back a thousand years, and as one of Europe’s top sights, draws up to 8,000 visitors a day (! ), mostly to see the Alhambra. However, Granada offers many more antiquities to see, among them a beautiful cathedral and the Albayzín, the best-preserved Moorish quarter in Spain. 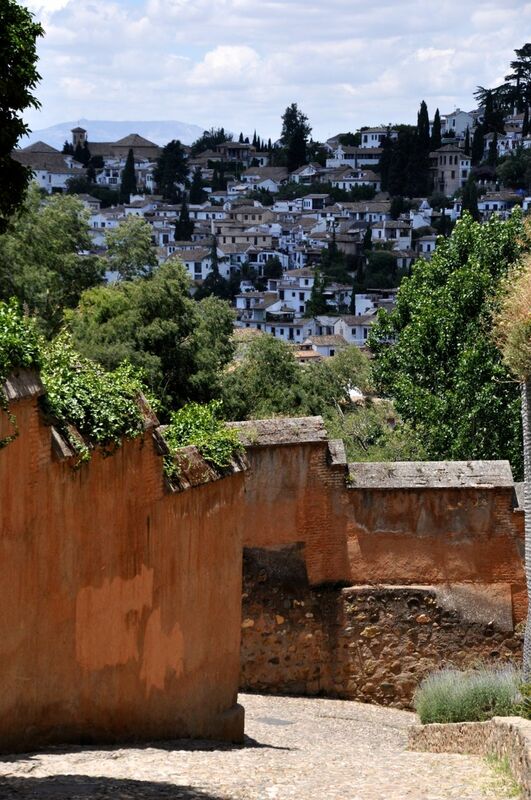 The Albayzín flows down a steep hill across the river from the hill on which the Alhambra was built. It’s a picturesque place, and strikingly different from the rest of Grenada! That picture of modern Grenada shown above was taken from the Albayzín; you stand in a Moorish world from the 1400’s, and look through a time warp into a modern, bustling city. Let me start by showing you this historic center, home of a grand cathedral, the burial chapel of kings, the old silk market, Moorish baths, and a surviving caravanserai (a roadside inn for merchant travelers and their camels). Although the modern city has infiltrated and surrounded these landmarks, the shops and plentiful restaurants absorb both the locals and hordes of tourists remarkably well. Also doing well are the street performers, who are quite good, as shown below. Some of the city’s North African heritage can still be seen in the open-air market for spices and herbs, and the many open-storefront grocery shops that abound. Granada was under Muslim rule for 700 years, the last 200 seeing it grow as the Reconquista slowly drove refugees here. By 1400 Granada held 120,000 people, very large for Europe at that time. The plazas here were bustling with the city’s main (and rich) markets. Later, under Catholic rule, this area became the Moorish ghetto. Then, with the Inquisition (1500), thousands of Arabic books were burned, the mosques razed, Muslims evicted or forced to convert, and the Cathedral built on top of the old mosque. And oh my, a statement was made with the Cathedral! 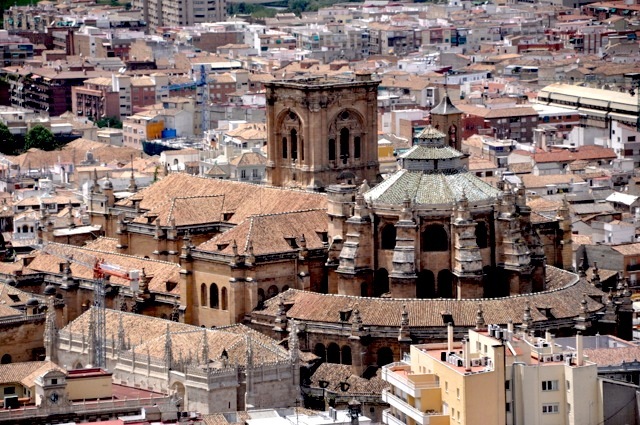 It’s the 2nd largest in Spain after Sevilla’s (post of July 11, “Sevilla and its Cathedral”). It was built in Spanish Renaissance style, and finished 181 years later with Baroque decoration. It’s hard to get a picture of the Cathedral from the outside, since it’s surrounded by other buildings, but it practically screams “Triumph!”. A picture of the impressive exterior, and pictures of the equally impressive interior, are shown below. The Cathedral houses a collection of illustrated music sheets, mostly Gregorian chants from the 1500’s. The artwork in these miniatures is amazingly beautiful!! 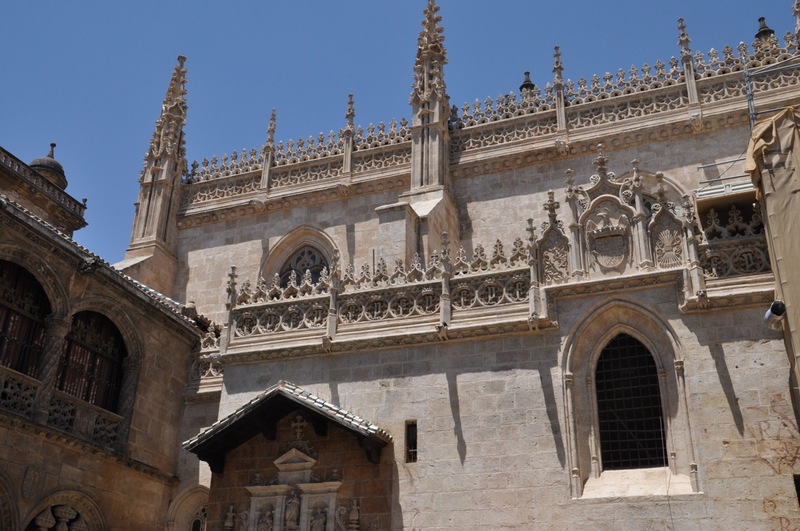 At about the same time as the Cathedral was being built, King Ferdinand and Queen Isabel decreed they wanted to be buried in the city of their final Reconquista triumph and ordered a Royal Chapel be built for that purpose. 500 years ago, this was the finest that money could buy – they spent 1/4th of their wealth on it. It was completed in just 15 years. The style is Plateresque Gothic – Gothic simplicity combined with Mudejar decoration. Externally there is not much to see, since 3 sides are connected to other buildings (including the Cathedral). Pictures were not permitted inside; the marble figures of the king and queen in repose are impressive – carved in Italy. Originally this was an important Moorish silk market with 200 shops (sufficiently important that all of it’s 10 gates had armed guards ). Destroyed by fire in 1850, it was rebuilt later that century for the tourist trade. Today it has (unmanned) gates, a series of interconnecting narrow walkways, and marble columns defining the many very touristy shops. brickwork . The 1300’s! Doesn’t the inside look an awful lot like today’s motels? You park your camel instead of your car. It’s always amazing how the basic things we need really don’t change that much through time. Even 2000-year-old houses that we saw in Pompei, Italy looked very livable and inviting! Public baths were a big part of Muslim community life, not only for cleansing but as a place to socialize or do business. After the Reconquista, the Christians assumed that conspiracies might also be hatched there, so few survived. Below is a survivor from the 1000’s, with the traditional cold room, warm room and hot room, and the heating below the floor. It’s all very Roman, except the Romans had pools; the Muslims just doused. 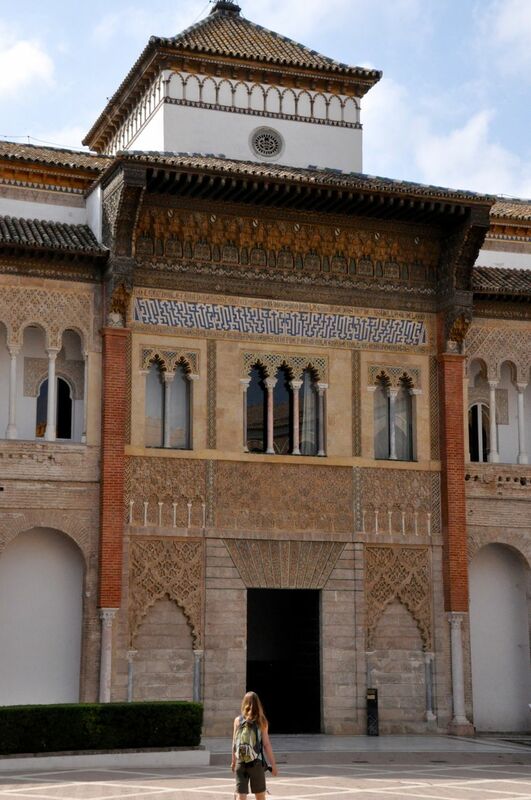 Just across from the Royal Chapel is the Muslim madrassa or school, which became Christian Granada’s City Hall. Today the outside has a strange paint job – those mortar joints are not real (picture, left)! 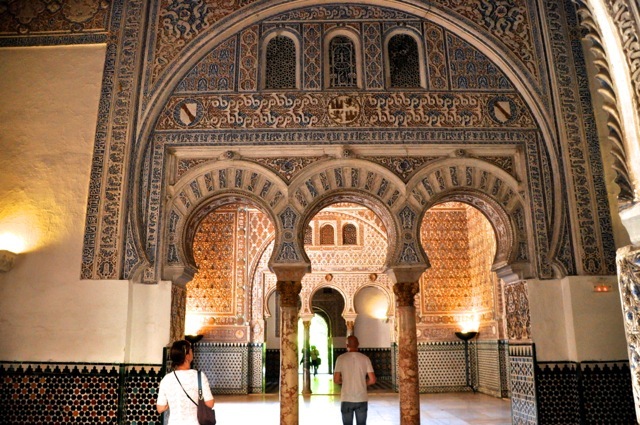 But inside, there is a lot of true 1400’s Muslim decoration (not Mudejar), and it is outstandingly beautiful. The 4 Gatos (you can see the patio umbrellas and awning in the first picture above) – and turn left. Well, that takes us into a closed courtyard surrounded by building walls! Eventually we discovered an alley at the very end of that courtyard that goes off to the right but was invisible from the street, (red arrow in left picture above – you’ll need to click on the picture to see it) – and eventually found the right building. Welcome to the maze! Our small apartment is on the 2nd floor of the house shown by the blue arrow in the left picture above. On the inside, picture to the right, it’s definitely Moorish; old wood timbers and columns and an interior courtyard that was the style then. The apartment isn’t much, but that courtyard is pretty cool. tourist shops, many of the latter sprawling into the street itself. As you climb (and climb) higher, all that falls away and its just you hemmed in by close-set buildings on narrow twisting streets/alleys, until you turn a corner and are surprised by a small stone water fountain, or colorful tiles, or a cafe with umbrellas, a view of a residential patio garden, or a delightful small shady park. Stopping at a cafe for a sangria or mojito on the hot climb is pure heaven! Let me show you examples of the streets. Notice that many of the streets are actually steps. There are 20 or so small churches here in the Albayzín, all sitting on spots that were once mosques. They are often simple, to make it easier for the (you-better-convert-or-else) ex-Muslims who were not used to worshiping among images. Below are two pictures of such a church (the alter was not so simple! ), along with a picture of a picture of a convent from the 1500’s – it looked like it would be impressive, but it was closed when we came by. 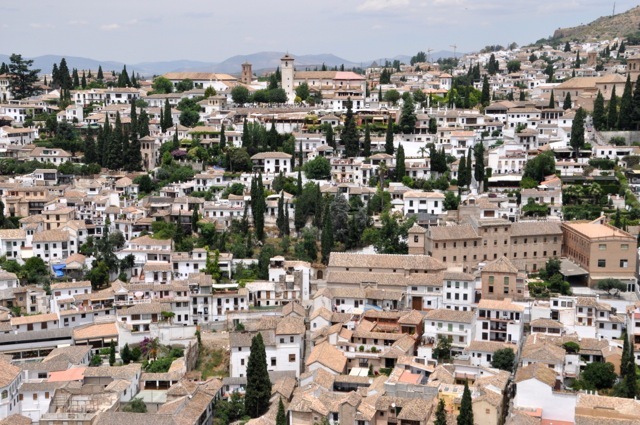 There is another interesting aspect to Granada – it has a distinct gypsy population of about 50,000, and although they’ve been in Granada since the 1400’s, they remain unassimilated. Many of these gypsies live in a district directly connecting with the Albayzín, the Sacromonte. This very colorful low-rent district (cave-dwelling is common, for example) also attracts “hippies” and some of Spain’s youthful unemployed (50% unemployment for the under-25!). Many gypsies work the tourist crowds, and in general, deserved or not, they have a less-than-sterling reputation. 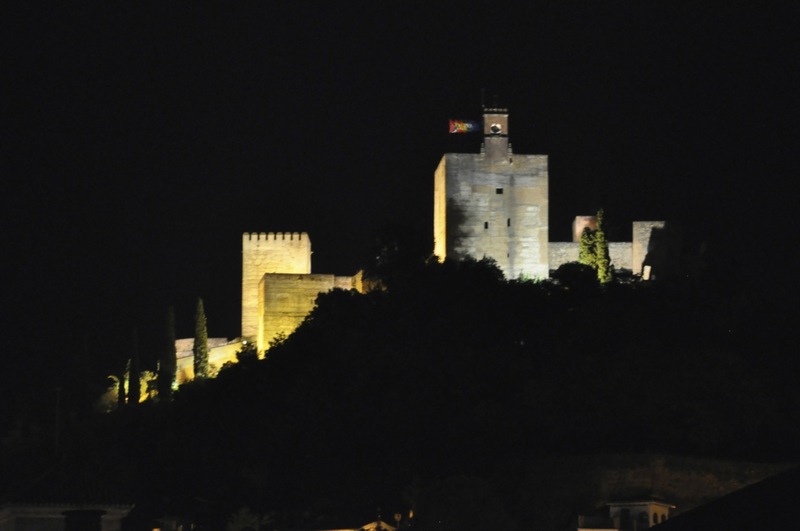 Put it all together, and guide books voice strong concerns about being in the Albayzín after dark. Certainly Ginger had some reservations – after all, the place is nothing but dark alleys – but this is Spain, the land of the mid-day siesta producing a time-offset; restaurants don’t open for dinner until 8 or 9pm, it’s cooler then, and the Alhambra seen from the Albayzín is gorgeous at night, as you can see from the picture on the left. So with a little prodding from me, off we went into the nights, and happily we had zero problems. I really wanted to see the Sacromonte; there are tours that take tourists to bars and the gypsy Zambra dance (a flamenco variation), but we’re wary of (non-authentic) tourist shows. I decide to walk there (in daylight), but Ginger is not enthusiastic; I’m on my own. So I scale the Albayzín, and then down, and then up the Sacromonte, and it is sunny and I am hot, but it’s interesting. From where I am the Sacromonte looks normal and well kept, until I realize that it’s not quite normal; most of the buildings and houses I’m seeing are just fronts with no depth; the houses are built into the hill (or into a cave, who knows?). It’s similar to an Italian hill town, except the town is mostly hill! Also I notice that I seem to be the only person in the world. It is siesta time, and other than an occasional car coming by, nothing but nothing is stirring. I see a sign announcing there is a restaurant/bar up this driveway, and I’m hot and thirsty, and maybe I can find me a gypsy! So up I go, up quite a steep, curving driveway, which continues up for much longer than I anticipated. And up! It’s a bloomin’ mountain! I get there, and it is closed. Drat! Learning: Gypsies take their siestas very seriously. Time to go home. On the way out, I come across a guide with a family on tour, on Segways. We’re at the top of a quite steep and long hill, looking down, and the guide is talking to a young lady on her Segway “You just release the brake and lean forward ….” Think Olympic ski jump …. After I reached the bottom, walking, the Segways were still up there. Let me finish with a view of Granada food. It wasn’t too shabby! Not only is the food quite good, but it often comes with a great view, particularly in the Albayzín. 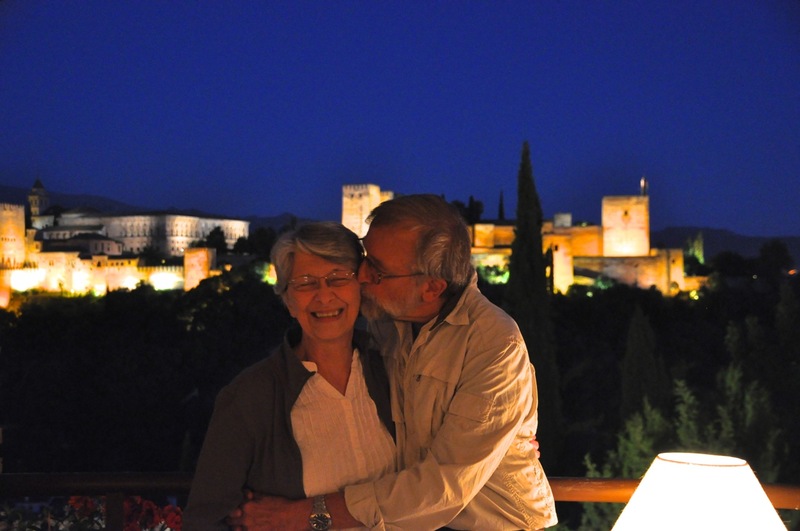 One of our favorite restaurants has an impressive view of the Alhambra. It’s at a popular spot, the San Nicolás viewpoint, and as you can see in the picture a lot of people hang out in the small park there to catch the sunset. Just below that gray wall (and across the street) is the restaurant – those dark bays above the white wall are the restaurant windows. In the pictures below we’re inside that restaurant looking out, and we’ll share the view of the sunset with you – oh, and maybe you’ll notice the Alhambra is part of the view …. Is that romantic or what??? Next post – inside the Alhambra! Córdoba is a fascinating city, and the highlight of our Spanish trip. We loved it. It’s dripping with history; the intersection of Christianity and Islam is most vivid here. It was an outpost of the Roman Empire, but by the time of Julius Ceasar it had become Rome’s regional capital. The Visigoths took over in the late 500’s, but in the early 700’s it was captured by the Moors. Then it flourished! In the 900’s it became the regional capital of the Muslim world, and surprising to me, the world’s most populous city and it’s intellectual center (the rest of Europe was mired in the Dark Ages). It was famed for its artistic expression, dedication to philosophy and science, and its religious tolerance (although Islam was preeminent, Judaism and Christianity co-existed [and it still has an historic Jewish Quarter]). The “Ornament of the World”, it reportedly had 3000 mosques, splendid palaces, 300 public baths, and the largest library in the world, housing as much as a million volumes. All of that changed quickly with a new hard-line ruler in the late 900’s. Gone was religious tolerance, books on philosophy were burned to please the Muslim clergy, and the other volumes were sold or lost in the ensuing power struggles/battles (some things don’t change in the Muslim world). The city declined steadily, and in the early 1200’s it was captured in the Christian Reconquista. 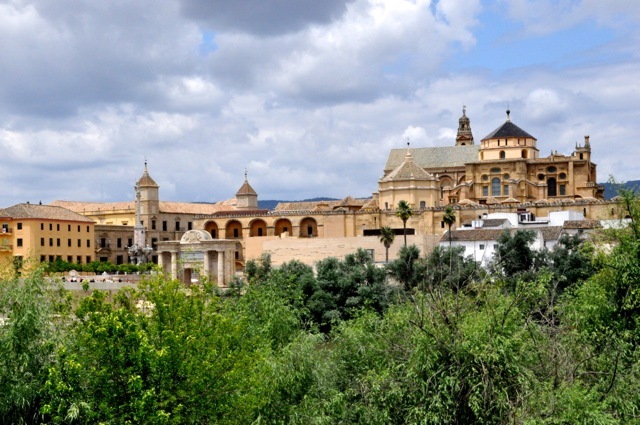 Today, Córdoba’s big draw is the mosque-turned cathedral called the Mezquita. Remarkably well-preserved, the Mezquita gives a fabulous glimpse into the Muslim world of the 900’s, and stands in stark contrast to the Catholic religion that replaced it. It’s visually and emotionally breath-taking. It blew us away. You’ll see. quite striking in it’s own right (picture on the left). 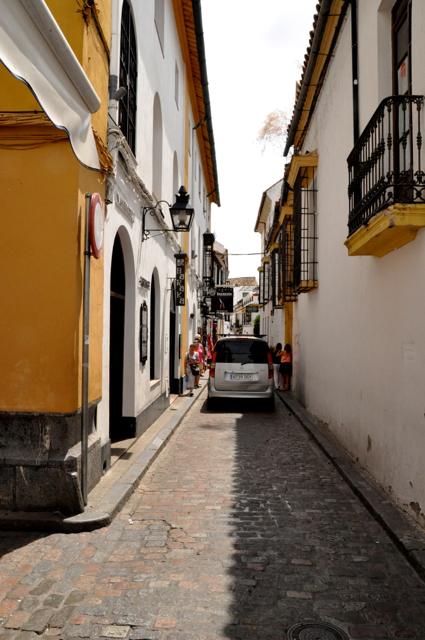 Sevilla has taught us well (June 24, ’13, “Sevilla – Getting there”); we’re getting used to driving and parking in impossible places; as you can see in the picture below, medieval streets are narrow and make right-angle turns with little room for error, and we’re driving these streets and not even breathing hard! Well … maybe a little. Maybe an occasional “Eeek …. Eeek!” from Ginger. Much better than the screaming and beating I was getting before. The barrio is quite attractive, although many of the stores have a decidedly tourist nature to them. The jewelry in some of these stores is actually pretty amazing; artisans are at their benches. Much of the area has white-washed walls, with flower pots hanging everywhere. We haven’t been to Greece yet, but we think it must look something like this. Residential areas are quite attractive, and courtyard gardens are a big deal here – which is also reflected in the greenery in some of the restaurants, as shown in the last two photos below. 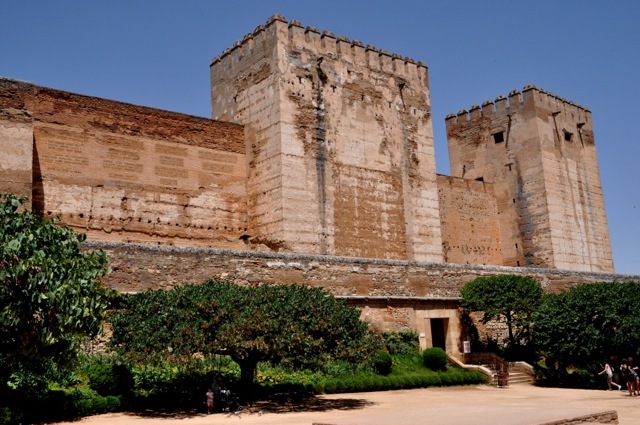 First we’re going to show you the Alcazar – Castle of the Christian Kings. It’s an impressive fortress from the outside and the inside gardens are attractive. We didn’t pony up the admission fee, but did buy tickets for an evening concert being held on the grounds, hence the evening pics of the gardens. Alas, the concert was cancelled when it started to sprinkle just before starting time (musicians have expensive instruments). medieval world. From the pictures above, you can see that the mosque is absolutely massive! It goes on forever. Also note that the walls are far from plain; even after 1200 or so years the (no longer used) entrances are impressively beautiful, shown below. Now let’s go inside. One enters first through a grand portal into the Patio de los Naranjos (Courtyard of the Oranges) where Muslims would perfom a ritual washing before entering to worship. The massive bronze door at the entrance looks exactly like the one in the cathedral in Sevilla (July 11, 2013, “Sevilla and its Cathedral”). It’s magnificent. complexity of Allah’s creation. These are double arches, made from alternating red brick and white stone, sitting on top of marble, granite and alabaster columns (many of the materials are recycled from Roman ruins and Visigoth churches). The arches are a neat engineering trick: supporting the ceiling with such thin columns required extra bracing using double arches. concerning the Mesquita, including its use for prayer again. The Catholics argue that the Mezquita was always a Christian church, and the Muslims were just temporary residents (for 500 years!). The battles continue …. Below are pictures of some of the beautiful ceilings in the mosque. There are many, many patterns in these decorated ceilings, some of them similar, but we couldn’t find an actual repeat. They’re gorgeous. approach to the mihrab, the mosque equivalent of a church’s high alter. The mihrab is a decorated niche/room where the imam would stand facing toward Mecca, with his back to the crowd, and read from scripture, give sermons and pray; the dome of mihrab was specifically designed to amplify the voice of the imam throughout the mosque. The mihrab is spectacular!!! This artwork, done in the AD 900’s, still sparkles and bedazzles more than a millennium later! Its beauty and its amazing intricacy are mind-boggling. It is impressive from afar, but even more impressive the closer you get. Decoration is on everything, everywhere you look, yet the effect is not excessive. Reflecting the incredible wealth of Córdoba, the art was fashioned by Byzantine mosaicists using 3,000 lbs of glass-and-enamel cubes to depict stylized leaves, flowers and quotations from the Quran. The pictures below do not do it justice, but they should give you a hint of its exquisite beauty (This artwork is also the wallpaper background of this blog). The surrounding stone carvings are also amazingly beautiful. 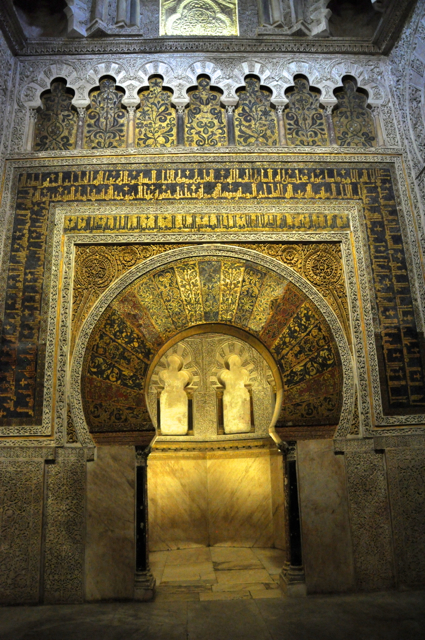 The mihrab is mirrored on both sides by studded doors each topped with a similarly beautiful arch. Even the grates above the arches are gorgeous. I hope you’re suitably impressed. Now return to the mihrab; with all that beauty in front of you, there is yet more to see by looking up! The effect is the visual equivalent of surround-sound, a full-amp display of sparkling beauty. Looking up at the dome, it’s fascinating! Eight beautiful intersecting arches form bays for eight skylight windows and frame a scalloped octagonal dome. Within that interior space the dome’s intricate ribs create a flower, the petals inscribed with beautiful flowers themselves. It’s spectacular! Curves within curves, octagons within octagons – the Muslim artisans were masters of geometric design. The mosque is absolutely vast – it could hold 20,000 people on their prayer rugs – yet the low ceilings and nearby columns create an intimate, enclosed and worshipful atmosphere. Well, when the mosque was turned into a church, what to do? No way were the Catholics going to be able to get 20,000 attendees from a Muslim city already in steep decline. So initially the conquerors did very little, replacing just 16 Mezquita columns with Gothic arches to make a small chapel. In the late 1300’s a Royal Chapel was built for the tombs of the now Christian Kings; it was never open to the public, and isn’t now, but I was able to take pictures from afar; the well-preserved Mudejar walls and dome are beautiful, as shown below. Peripheral regions of the mosque were re-purposed for Christianity, such as the incorporation of small chapels, tombs, baptismals, and the Treasury, examples shown below. Yes, the cathedral is beautiful. There is an extensive, if not bombastic, display of wealth and greatness and grand vastness. Emotionally, however, we were shocked. Within just a few feet we could immerse ourselves in the Muslim environment or the Christian environment. The evoked emotions were radically different, and our Christian roots were challenged! Surprisingly, going from mosque to cathedral was almost revolting! The mosque with its low ceilings and close columns was all intimacy with Allah and awe at the world’s beauty and endless repetition. The cathedral with its vast vertical space and elaborate, ornate displays of wealth evoked feelings of being small (and poor) before a distant, rich and very powerful God. I may not be able to express the evoked feelings well, but the difference in aesthetics and psychology between the two religions that leaps from this juxtaposition was easily felt by both of us. However, I would be remiss if I did not show you the truly amazing Baroque-era choir stalls in the cathedral, made in 1750 from New World mahogany, one of the masterpieces from this time. Each stall features a scene from the Bible. We’ll close this looong post with two final sections on the old city, interesting given that in the 900-1000’s it was the world’s greatest city (who knew?). Below are a drawing and a model of a portion of the city from that time, showing some of the city wall, to the right the Mezquita, and to the left the Alcazar (fortress) of the Caliph, the top Muslim ruler of the region. This was a city of maybe half a million people (! ), and the Mezquita wasn’t big enough, so Córdoba had many more mosques (! ), two of them (the twin mosques), located between the city walls as shown below. Note in the model the large waterwheel bringing water from the river into the city. Today there are still remnants of the old city, as shown below. Finally, we’ll quickly visit what remains of the baths of the Caliph, where apparently a lot of the Caliphate’s business was conducted. The baths were pretty fancy, as shown in the sketch, and involved the normal cold, warm and hot rooms, heated from under the floor (wear wooden sandals). The sketch shows it was an impressive facility, but today the ruins offer only a hint of that glory. That’s enough! What a fabulous city! Hope you enjoyed it. Next stop: Grenada and the famous Alhambra! NOTE: When I started this blog back in May of 2013, in Spain, I struggled to put pictures into a post, not knowing how to do it well. The struggle was enough of a hassle that I quit until I could master this blogging art (old-dog problem). Now, almost a year later, roosting in New Zealand with over 50 posts to my credit, I am returning to my Spain pictures to back-fill those adventures. And indeed, as much as NZ is an amazing adventure in physical beauty, Spain is an amazing adventure in culture and history. You’ll see. Aaaaaand, picking up where we left off, now we’re at Sevilla’s Alcazar. Oh my. Originally it was a palace built in the AD 900’s for the local governors of the local Moorish state (the picture shows an original palace wall). After the fall of Sevilla in the 1300’s the palace was extensively expanded and rebuilt when the Christian King Pedro the Cruel left his wife and moved to the Alcazar with his mistress. 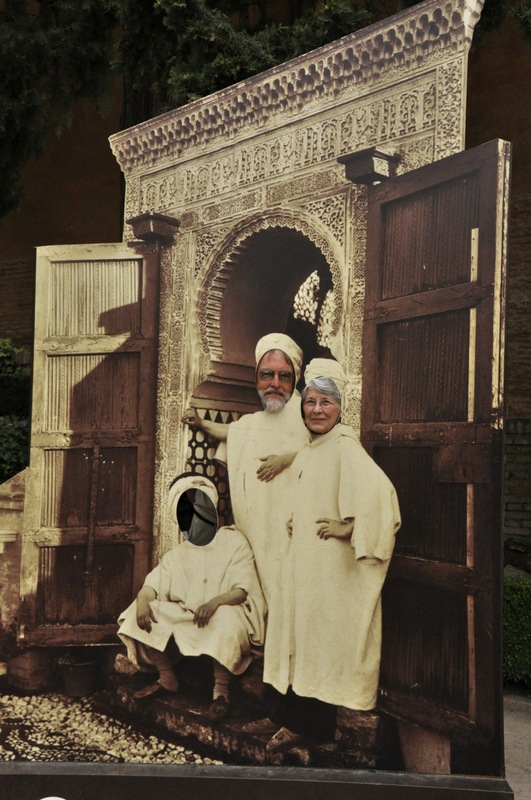 He hired Muslim workers from Grenada to recreate the romance of that city’s Alhambra (we’ll see Grenada in a coming post). The style is called “Mudejar” – built by Moorish craftsmen for Christian rulers – and even with the subsequent hodgepodge that comes from more than 800 years of lived-in renovation, the Alcazar is considered Spain’s best example of that style. Mudejar is distinctly Islamic, using tile and plaster and wood that is highly decorated with a dominant geometrical character. 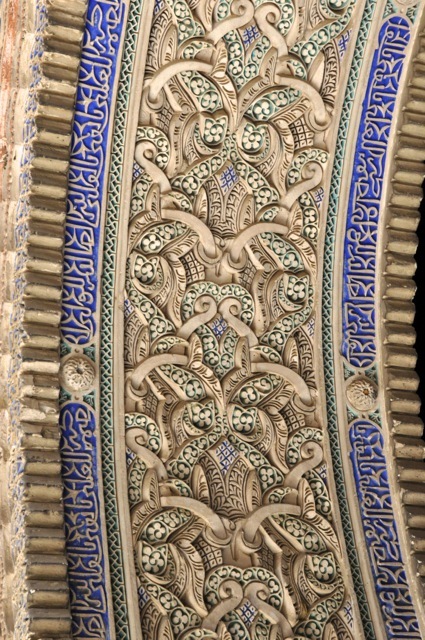 Its striking appearance is the result of the interconnection and superimposition of geometric design with different stylized elements such as stars, leaves, flowers, shells and calligraphy (quotations from the Quran) – anything but human or animal forms, depictions of which are forbidden by Islam. The Mudejar’s complicated patterns have never been surpassed in sophisication; computer analysis has shown that many of the patterns followed complicated mathematical equations. You might want to take a close look at the plaster decoration shown here (it’s the inside of an entrance arch). That’s plaster, carved in 3-D, with stylized flowers and leaves arranged in a complicated pattern interweaving and repeating. It’s truly amazing art, but it’s very hard to capture its intricacies with a camera – from afar the detail is not easily seen, and up close one can only view a tiny piece of the interconnecting, incredible and mesmerizingly beautiful work. The walls, the arches, the ceilings, and even the floors are all amazing. I’ll try to give you a feeling for it. One could stand and gaze at this stuff for hours – which I guess we did. The floor plan of the palace is very confusing, perhaps as a protective device and likely as a means to impress with surprises. It does that. Every turn, every corner is a WOW. The palace is still occupied today, but rarely, when the King and Queen of Spain visit (then the palace is closed to the public; hence tour guides are not big fans of royalty). In this picture, you’re standing in the Plaza de la Monteria; on the right is the Admiral’s Apartments from the early 1500’s. When Columbus returned with news of the New World, Queen Isabel realized it could result in big business and created this wing to administer New World ventures. To the left (out of view) is the Gothic Wing, built in the 1200’s; you can see a piece of it through the gate in the first picture. We’re going straight ahead into King Pedro the Cruel’s Palace of the 1300’s. Of course the palace has seen 8 centuries of living, and the colors are faded, and there are chinks here and there, so you’ll have to imagine how grand it must have been; nevertheless, although time has taken its toll, and colors are often gone, what’s left is still going to blow you away! First let me show you some close-ups of the entrance and upper level. Wow, we thought, clueless as to what was to follow. Then comes the interior, and it starts out “isn’t that nice”. Note the interesting ceilings! As we wander through the maze of interconnecting rooms, the “isn’t that nice” slowly ratchets up to Holy S…!” The intricate plasterwork begins to occupy the columns and walls, and the ceilings are incredibly beautiful, each with very different designs. We come to the Court of the Maidens, a central area surrounded by a number of other connected rooms, and likely an area where the king did business. Not too shabby! The upper level was actually added in the 1500’s (Renaissance style), but I think it works. Other views are shown below. The arched entrances to the other rooms have fabulous plaster decorations! The ceilings in the walkways are varied and spectacular, as are all the patterns in plaster. 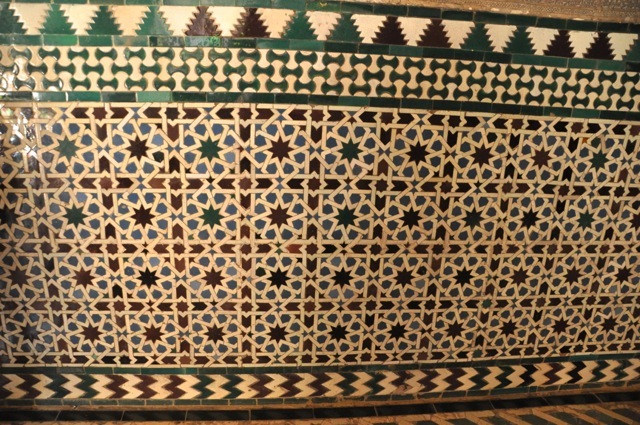 The lower part of the walls are solid tile in a great variety of intricate designs; in the one shown here, the geometric lines produce 8-sided stars and the appearance of squares, yet none of the lines makes even more than 1/8th of the side of a square! I dare you to try and follow the path of one of the defining lines! Below are pictures from some of the connecting rooms, beginning with a picture of one of the gorgeous wood shutters for the windows; each window has shutters with different patterns. Next we come to the Dolls’ Court, which gets its name from two tiny faces decorating one of the arches. This room is thought to be the harem in the original palace (rank has its privileges), but which became a private region for King Pedro and his family. Originally the court center had a pool, reflecting the once brightly colored decorative patterns. As we wander around, getting lost in the maze of rooms, I take more pictures, mostly ceilings and window shutters. Then we stumble upon this entrance. It goes to the Hall of the Ambassadors. The room is – can I find more superlatives? – the most fabulous amazing ornate spectacular palace room (see below). Because of the startlingly unique ceiling, it is also called “The Room of the Half-Orange”. and suddenly we’re in the Gothic wing of the palace. It’s strikingly different (see first two pictures), but it does contain some very interesting tapestries from Brussels dating to the 1500’s. 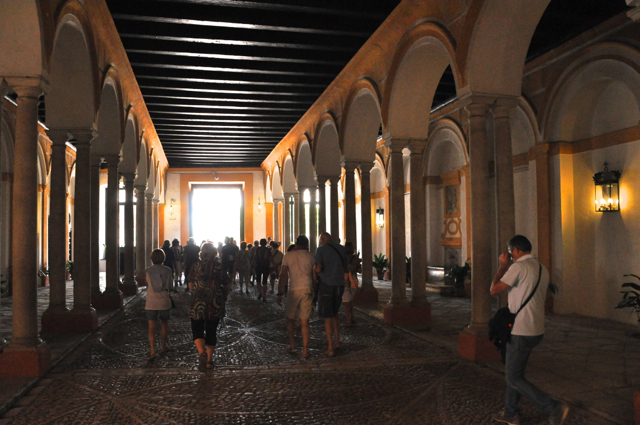 From the Gothic Wing there is an exit to the Gardens, which are more than extensive. Finally, we exit through what was once the “parking lot” for the visitors’ carriages and horses. Hope you enjoyed this visit to the Alcazar and its Mudejar art. 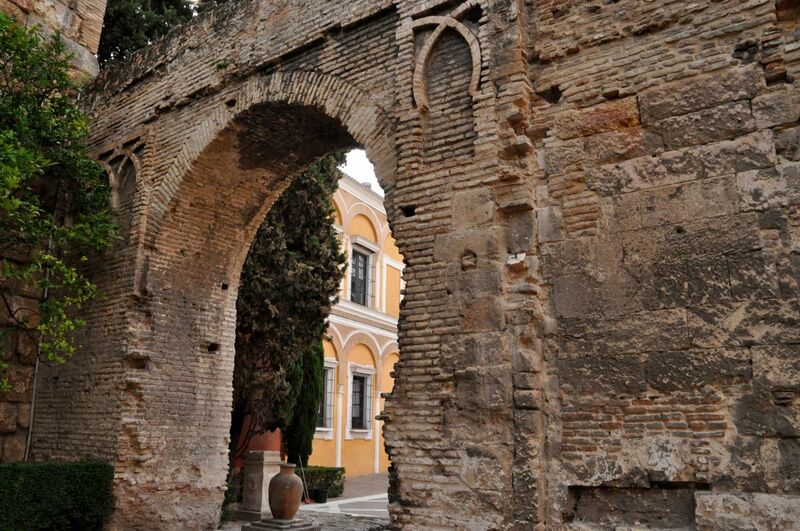 The next post will be about the fascinating city of Malaga on the Costa del Sol.